The Waffled French Toast with Foie Gras. 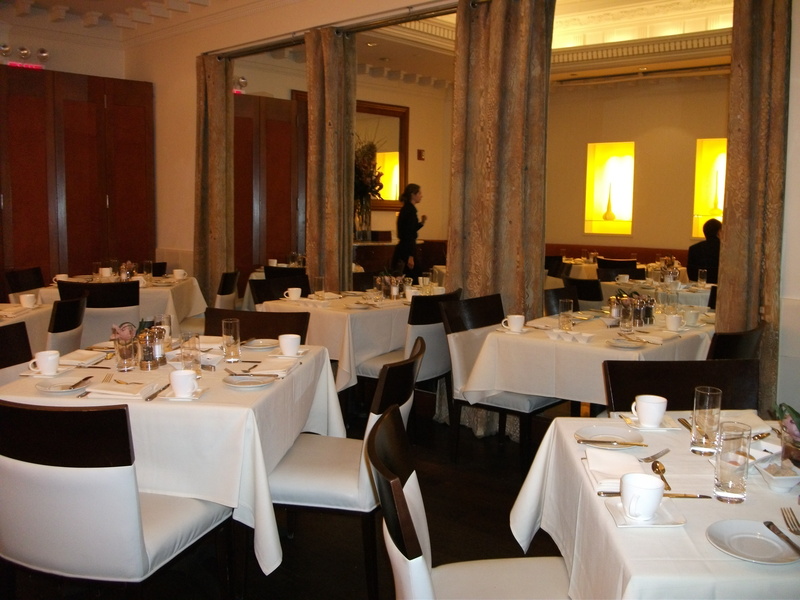 Chef Steven Zobel recently revamped Triomphe’s breakfast menu . The 2.0 version features dishes that range from decadent—buttermilk pancakes with praline butter,($18); eggs benedict with fried oysters, ham, spinach and hollandaise ($21); bagels and lox ($20)—to austere, like toast ($4) or Greek yogurt and fruit ($10). But I had a one-track mind. I had dragged along my friend Michael, a former magazine editor and writer, and, frankly, a bit of a breakfast curmudgeon. “Can’t stomach breakfast before 11am. Don’t be offended if I just have a poached egg,” he warned me. Arriving at 10am, we had missed the power breakfast rush (7am-8:15am) and had the place virtually to ourselves. It’s a lovely, intimate space. Designed by Ilan Waisbrod of Studio Gai in Chelsea, the room features a domed ceiling ringed by white moldings, walnut floors, oversized mirrors and a gentle backlit display of hand-blown glass above a sienna banquette. It may also be one of the last restaurants in town using white tablecloths. But I like that. A lot. All the better to enjoy the main event. I ordered an espresso and the you-know-what. Michael ditched his poached eggs for the truffled chicken salad sandwich (my second choice) instead. We were surprised when our server (unobtrusive and obliging) placed an amuse-bouche before us: a dollop of ricotta garnished with pistachios and house-made prune jam. Not necessary, but nice. 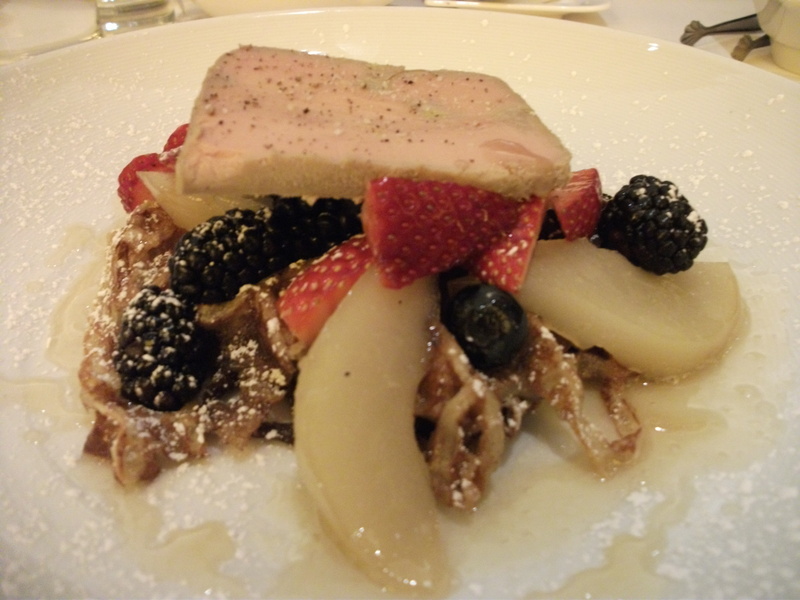 Zobel’s version of French toast, uses Challah, which is waffled, topped with poached pears, strawberries and blackberries, then crowned with a thin sliver of foie gras. Dabs of chestnut jam (on the Challah) add another subtle dimension of sweetness. It was the most delicate-tasting “French toast” I’ve ever had, a perfect balance of sweet and savory. I ate it all. It left me feeling happily satisfied, but not stuffed. 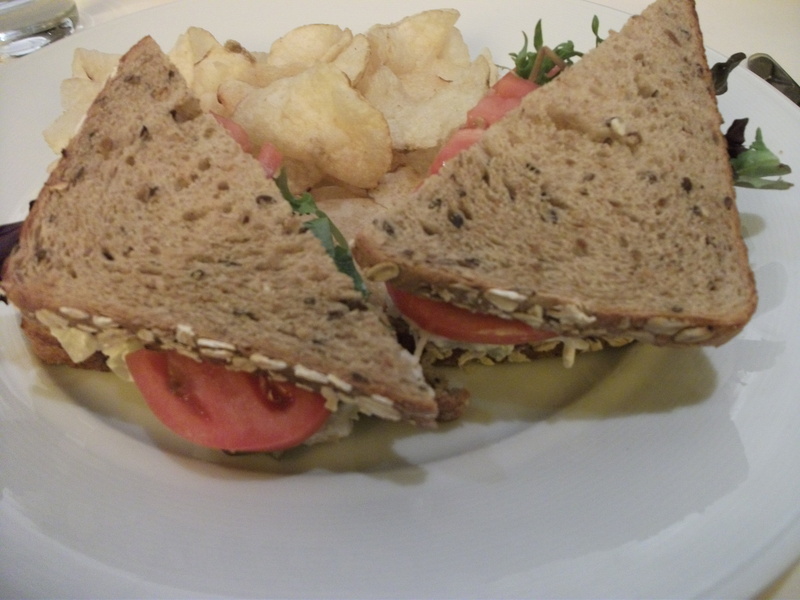 Michael’s truffled chicken salad sandwich was a tasty upscale country club take on a familiar classic. It arrived—a perky fluff of chopped chicken (all-natural Murray’s, I learned), finely minced celery and onion (first blanched to remove its bite), folded with house-made mayonnaise and truffle oil–compressed between two slices of seven grain bread, tomato and lettuce. Served with potato chips, its somewhat bland familiarity was oddly comforting. We’d gotten off to a very civilized start of the day. One that makes breakfast—in the right place at the right time—a worthwhile outing. 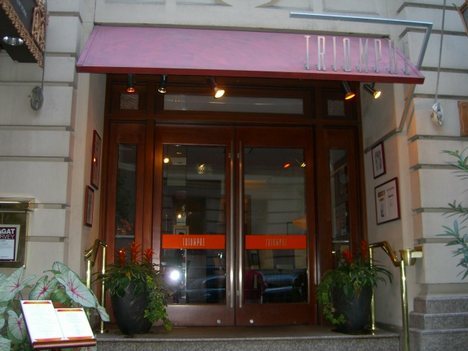 This entry was posted in New York City, Restaurants and tagged Iroquois Hotel, restaurants, Triomphe. Bookmark the permalink.